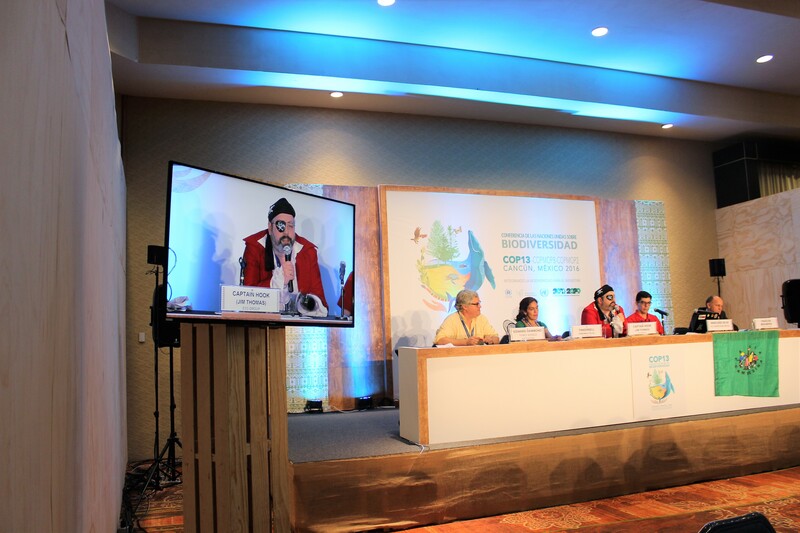 CANCUN – The Coalition Against Biopiracy (CAB) hosted the 6th Captain Hook Awards ceremony at the Thirteenth Conference of the Parties (COP 13) to the Convention on Biological Diversity (CBD) on December 9, 2016. 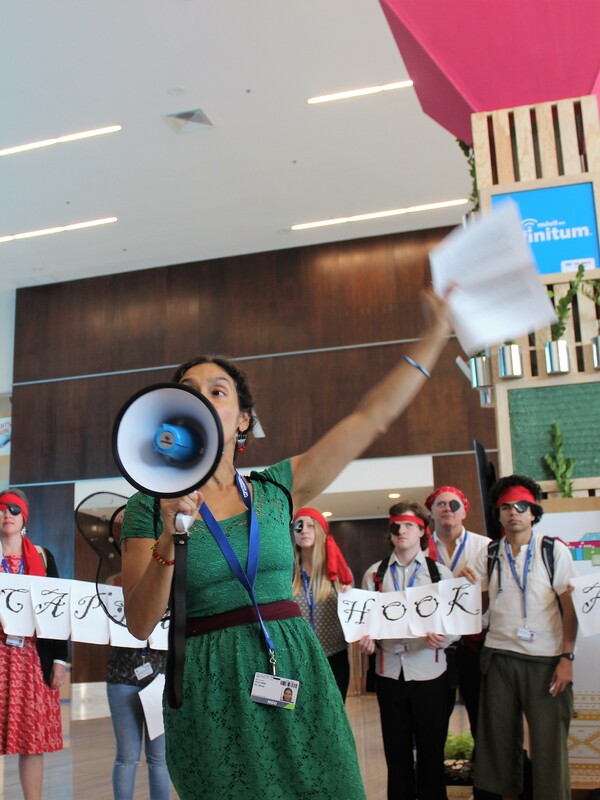 The public action in the main lobby of the Conference “celebrated” five biopirates – corporations, governments, and organizations that play a part to privatize genetic resources from Indigenous Peoples and local communities for profit – with an awards ceremony attended by civil society organizations and government delegates. 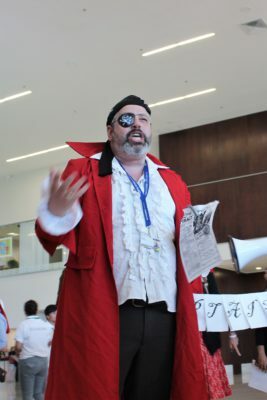 “High-tech ‘digital’ biopiracy is becoming easier than ever,” said the award’s Master of Ceremony, Captain Hook. 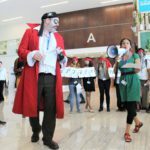 “With the accelerating tools of genome-editing and synthetic biology, today’s biopirates no longer need to carry their booty offshore in boats and airplanes – they can upload DNA as digital sequences in one location and then recreate it as synthetic DNA on the other side of the planet.” The implications of digital sequencing is a hot topic at COP 13. 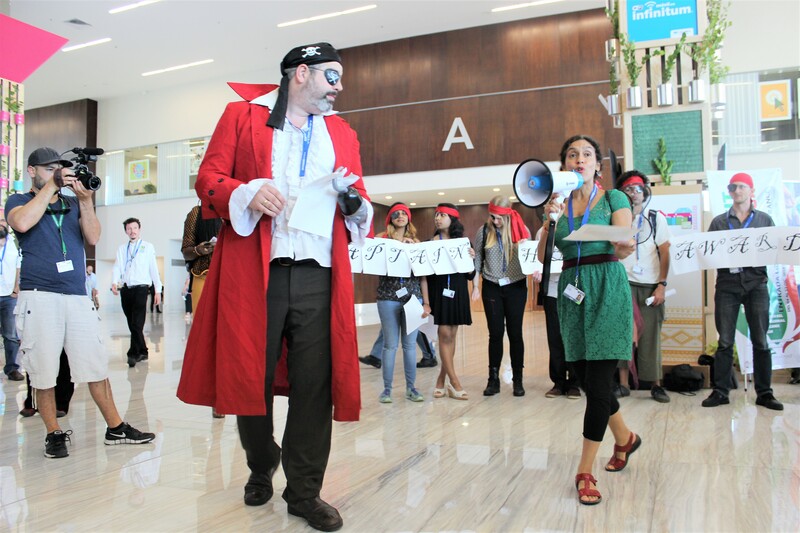 The Canadian Delegation at COP 13 was granted the Worst Government Behavior Award. “Canada deserves this award for attempting to delete any reference to digital sequences in the text at COP 13,” proclaimed Captain Hook. 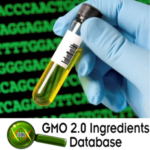 The Canadian government has also announced an investment of 30 million dollars into digitizing its biological collections without considering digital biopiracy or treaty rights implications. Brazilian Minister of Agriculture, Livestock and Food Supply Blairo Maggi was given the Two Faces Award for “saying one thing in the talks and doing another at home.” Maggi’s ministry has adopted measures in Brazil that limit the Brazilian commitments in the CBD; as one example, instead of ratifying Nagoya Protocol on Access and Benefit Sharing, they support the creation of the Legal Framework of Biodiversity which legalizes biopiracy in Brazil. Finally, the Greediest Biopirate award was shared by Coca Cola and Clarins. Coca Cola, the ubiquitous soft drink, earns massive profits on its so-called ‘Coca Cola Life’ while the holders of the traditional knowledge of the sweetness of Stevia, the Guarani groups living across Paraguay and Brazilian borders, make very little. “It is true that Stevia to has a bitter sweet taste,” remarked Captain Hook. Clarins was (dis)honored with the same prize for patenting African medicinal knowledge of harungana tree and selling its product for US $7000/kilo, while only paying $2/kilo to African farmers for dried leaves. “Clarins then had the audacity to call this deal a ‘fair trade’!” Captain Hook exclaimed. But it’s not all skulls and crossbones! The seas are also alight with beacons of hope. 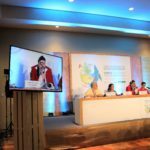 The ceremony also celebrated biodiversity defenders with the 2016 Cog Awards, which recognizes communities, organizations and individuals fighting against biopirates and threats to biodiversity on their land. Tinkerbell presented the award for Most Creative Legal Defense to the Mayan Council in Bacalar, Quintana Roo, including The Agroecology School “Educe”; The Beekeepers “Kabi Habin”; The Seeds Collective Much Kanan; and several ejidos. 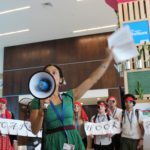 “They received this award for halting thousands of hectares of transgenic soy in their region through an innovative legal strategy: refusing to be ‘consulted’ by the corporations,” Tinkerbell explained. Tinkerbell also presented the Best People’s Defense to People’s Permanent Tribunal – Mexico Chapter for their 2014 ruling in favour of a total prohibition on transgenic corn in Mexico, and for declaring transgenic maize a crime against humanity. Tinkerbell: Veronica Villa, +52 1 55 5432 4679, veronica@etcgroup.org. 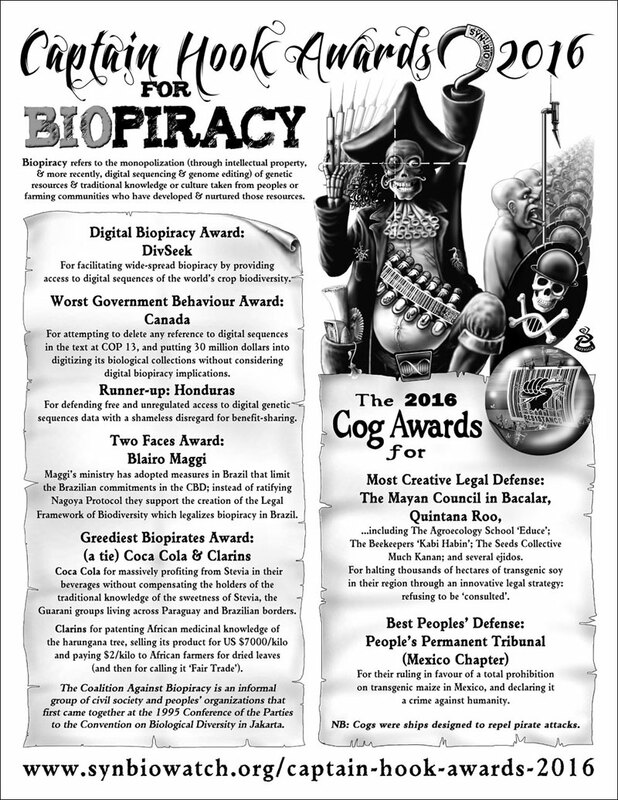 More information and supporting materials for the Captain Hook and Cog Awards can be found at http://www.synbiowatch.org/captain-hook-awards-2016. 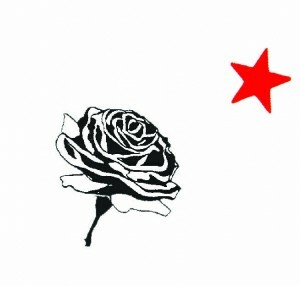 The Captain Hook Awards are put on by the Coalition Against Biopiracy, an informal group of civil society who first came together at the CBD in 1995.